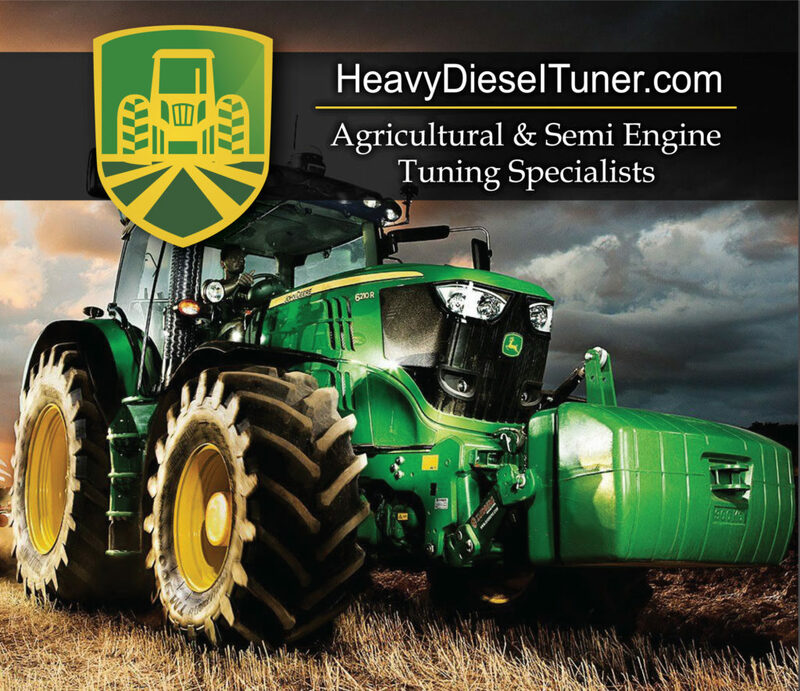 Disclaimer: Heavy Diesel Tuner, its distributors and outlets shall be in no way responsible for the product's proper use and service. The buyer hereby waives all liability claims. The Seller disclaims any warranty and expressly disclaims any liability for personal injury or damages. The buyer agrees to indemnify the seller/manufacturer and to hold the seller/manufacturer harmless from any claim related to the item of the equipment purchased. Under no circumstances will the seller be liable for any damages or expenses by reason of use or sale of any such equipment. The buyer is solely responsible for all warranty issues from the vehicle manufacturer. The installation of this product indicates that the buyer has read and understands this agreement and accepts the terms and conditions. 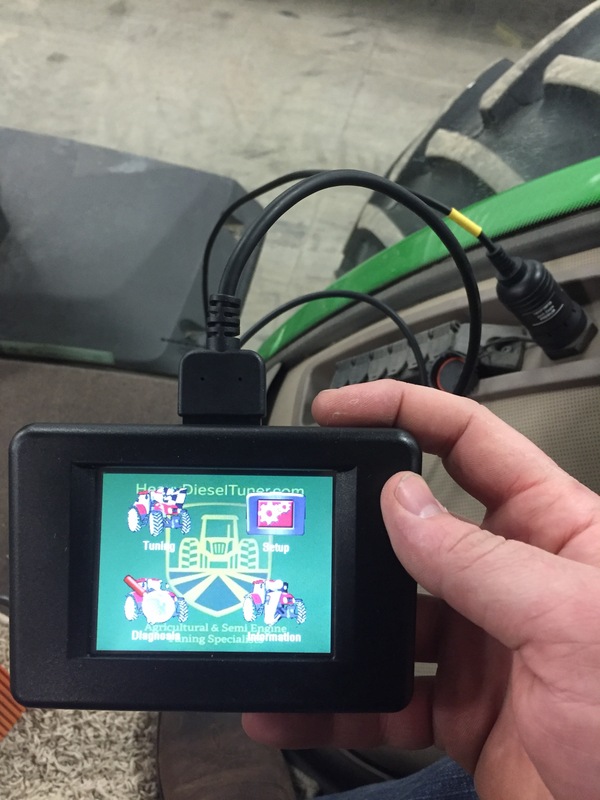 the plug in and connect the HDT Interface harness as shown. 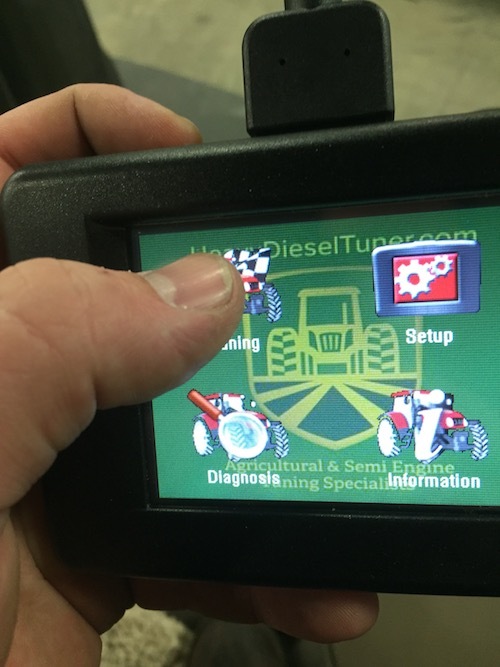 Select the top left Icon "Tuning"
Using the UP/DOWN arrow scroll the list of machines until you find the correct category. Once located push on the correct category which will highlight the tab in white then press the RIGHT arrow to continue. Locate and select your model, press the RIGHT arrow to proceed. You will now be asked to Read the stock file from the computer press YES. Wait for the read process to complete. 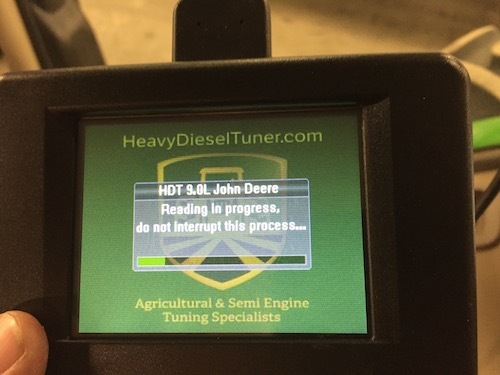 Once the read process Click OK The tool will return to the main menu and you are able to disconnect the programmer from the machine. 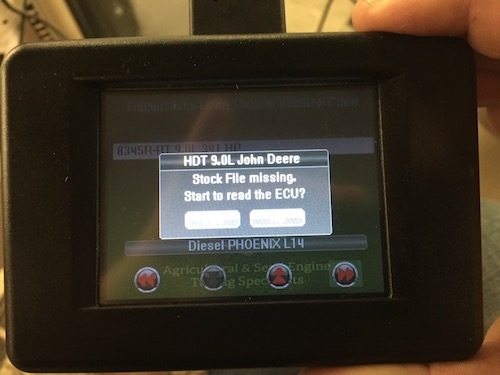 With the read process you are just reading the ECU not modifying it in any way so once the read is done and stored into the programmer you are able to start the engine and use the machine as normal. You will now need to go to your computer and install the supplied CD. 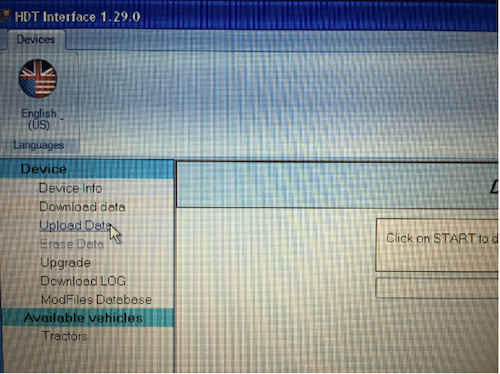 The program should auto run and click on the HDT Interface Icon. Install the software to your desktop, plug in the tuner to the laptop using the provided USB cable and double click the HDT Interface Icon. The software will open and immediately look for the programmer tool. Once the tool is identified you will now click on the "DOWNLOAD DATA" tab and click "START" Once the program has been read it will ask you to name and save the file. 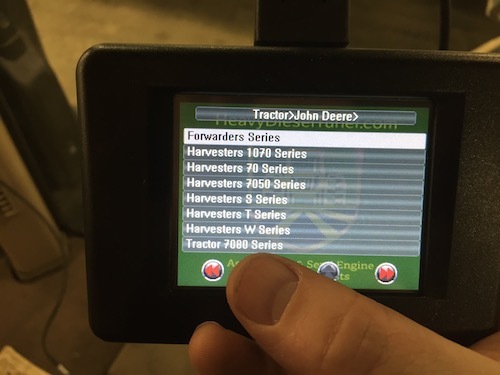 We recommend saving your name/model of machine/Stock/READ (ex. 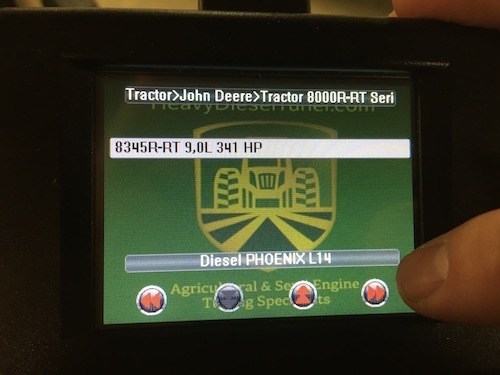 John Doe 9510r Stock READ)Select the desktop location to save the file for easy retrieval. Once you have saved the stock read file to your laptop email the file to us with a description of what you would like done (power increase, deletes etc.) including your name and phone number on the email. Once we have modified the file and emailed it back you will need to save the new tuned file to your computers desktop. 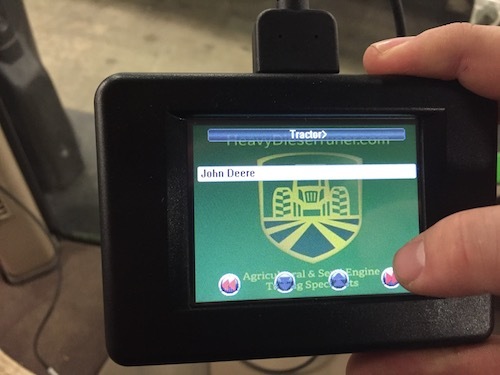 Connect the programmer using the USB cable and open the HDT Interface software. You will now need to click on the "UPLOAD DATA" Tab. Click on the "BROWSE" button and select the file from your desktop. Confirm the upload clicking YES. Once the upload has completed you are now ready to close the software and disconnect the tool for your computer. You will be prompted to continue with writing the file click Yes. 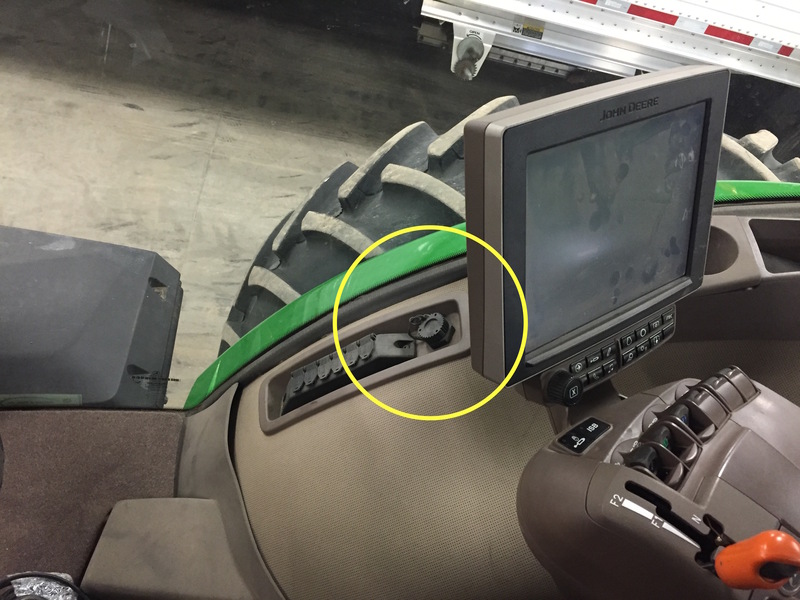 Turn the ignition key ON and click OK. Wait for the writing process to complete. DO NOT TURN THE KEY OFF OR ATTEMPT TO START THE ENGINE! 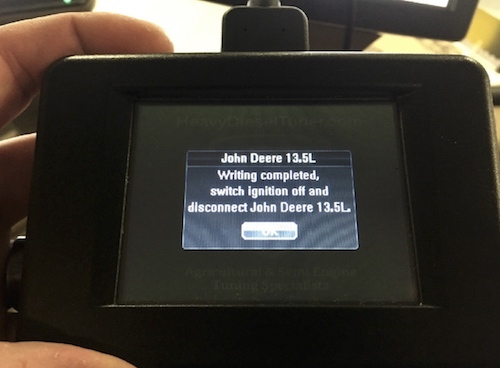 Once the writing process is completed you will now turn off the ignition and disconnect the tool.